Well, we're officially at the halfway point for this feature and I've decided to commemorate the occasion with a very special movie: the Exorcist. This one's been on my cinematic horizon for 10+ years and I've never seen it. This was that movie growing up. I had a small handful of friends who had seen it, all of whom ruled it the "scariest movie EVER" and that if I saw it I would "totally freak". The specter of the Exorcist has hung over me for too long, now it the time for me to confront my demons and watch the scariest movie EVER. Am I up to the task? Can I stand to make it through all two hours of terror? 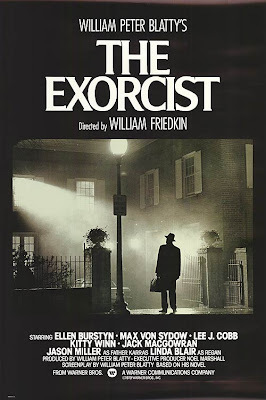 Giving a synopsis of the Exorcist is pointless in this day and age, it's too established a classic not to be. But, for the sake of organization and posterity, here goes. 12-year-old girl Regan MacNeil (Linda Blair) gets possessed by a demon. It's up to two priests, veteran exorcist Father Merrin (Max von Sydow) and skeptic Father Karras (Jason Miller) to save her and drive the demon from her body. Between the beginning and the end there's some Assyrian archaeology, pea soup, mommy issues, and masturbation-via-crucifix. Just another fun night out at the movies. I must say that I found the Exorcist to be overhyped. Not to slight the film in any way, but I've been more scared by lesser films. Perhaps it's because I've watched the Evil Dead Trilogy multiple times a year since high school but the scenes of Linda Blair's possession didn't really fill me with fear. Actually, the scenes that really shook me up were the instances were director William Friedkin subliminally stuck images of the demon Pazuzu in frames during a few key scenes. These scary images showing up without warning really kept me off step and made me dread their return throughout the picture. The final confrontation between the two priests and the demon (the old "the power of Christ comples you!" scene) was pretty sweet, or as real critics might say "powerful". Also, I greatly preferred the plot line dealing with Karras' crisis of faith resulting from the death of his mother to Regan's mother's movie career and her being so distressed about the possession of her daughter. Despite a few scares in the first half, Exorcist failed to live up to my expectations. Maybe I'm just that badass after two straight weeks of horror movies. Or maybe I'm not 11 anymore.